Updates throughout in this updated 5 BR, 3.5BA colonial in the popular Champions Village Subdivision. Situated on a quiet cul-de-sac and 15th hole of Muskego Lakes Country Club. 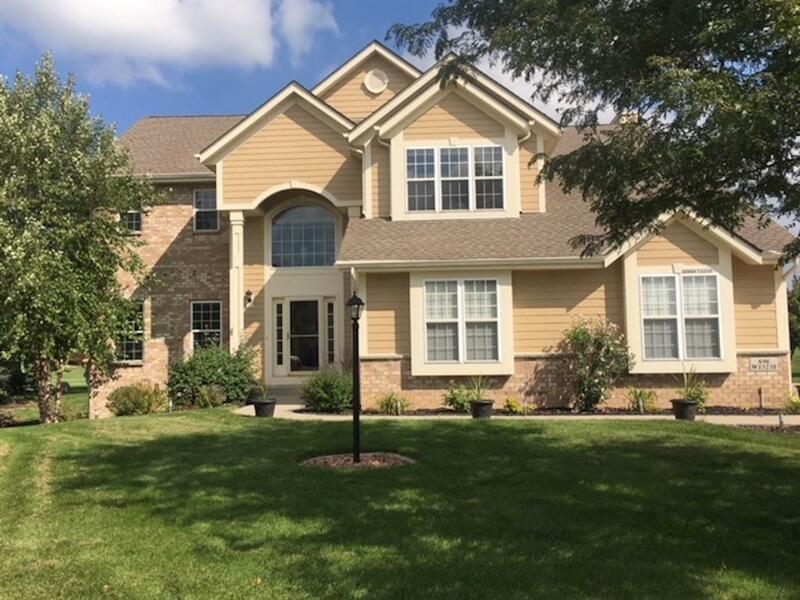 You'll be welcomed by the grand 2 story foyer, formal Living Room, open concept to DR. Large cooks kitchen w/ center island, solid surface ctrs, pantry & hwf's. Grand 2 story Great Room w/ GFP & 20' ceilings. Upstairs is a private Master Suite w/dual sinks, jetted tub & large walk-in closet. 3 bedrooms and a full bath complete the upper level. Freshly finished lower level perfect for entertaining, 5th bedroom and full bath. Add'l updates include: new carpet throughout, SS appliances, furnace, A/C, fresh paint, deck re-stained, garage painted & floor surfaced, refinished cabinets in kitchen, living room and baths.